So yes, i barely post but this is so important to me! On the 21st of June, Me and 19 other girls are taking part in the 5k race for life marathon😀 Obviously not running(pft who runs anymore?¿) We're all just going to walk and take our time! blog! Now you can donate anonymously so dont worry if I dont know you😌 Also every little helps💗 Any donation is an amazing donation! 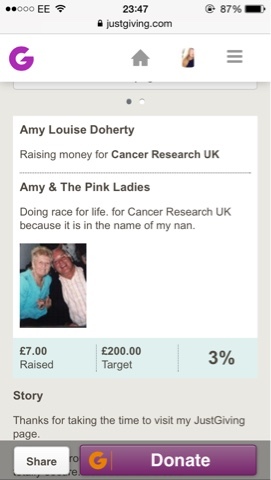 Please donate, if not to my sponsorship then to the charity! Any charity! Do a good deed today!